Easy to make Quinoa Stuffed Delicata Squash – Use cooked quinoa or any kind of leftover grains (brown rice or farro taste great!) 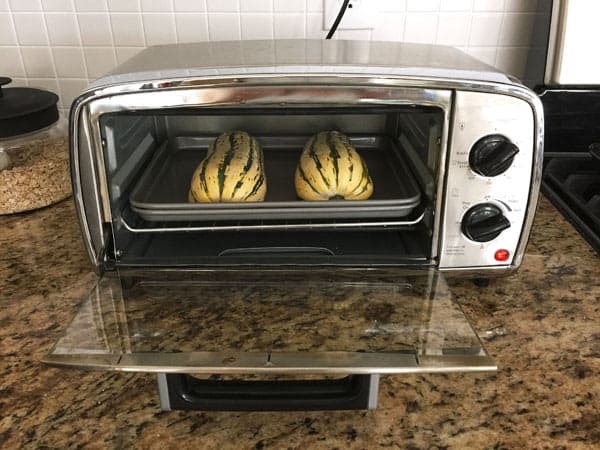 to stuff a pair of toaster oven roasted delicata squash boats. Depending on how big the squash is you’ll either have a hearty dinner for one or a nice side dish for two! 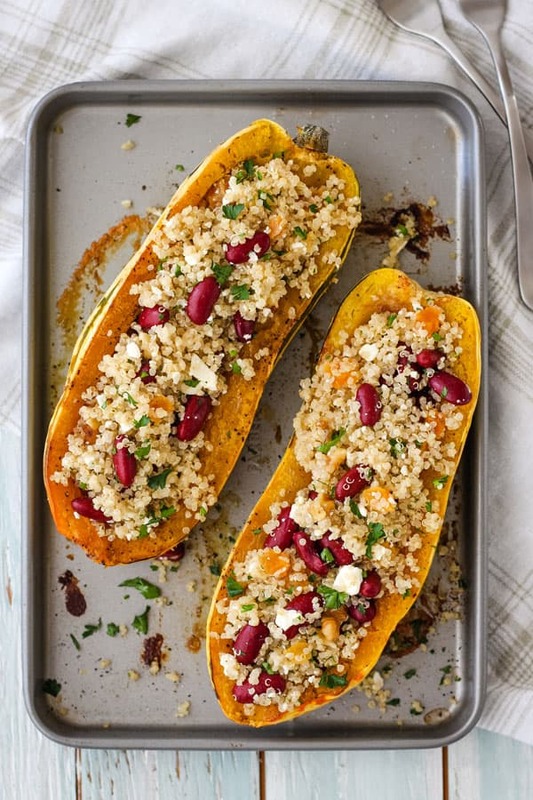 This quinoa stuffed squash is full of delicious flavor. 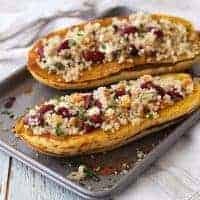 The sweet roasted delicata squash is the perfect match for a fall salad of nutty quinoa, creamy red kidney beans, dried apricots, and tangy feta cheese, drizzled with a bright orange juice and white balsamic vinaigrette. While I love a good acorn squash bowl, delicata squash is my favorite to stuff because it cooks up faster and you can eat the skin…how fun is that! 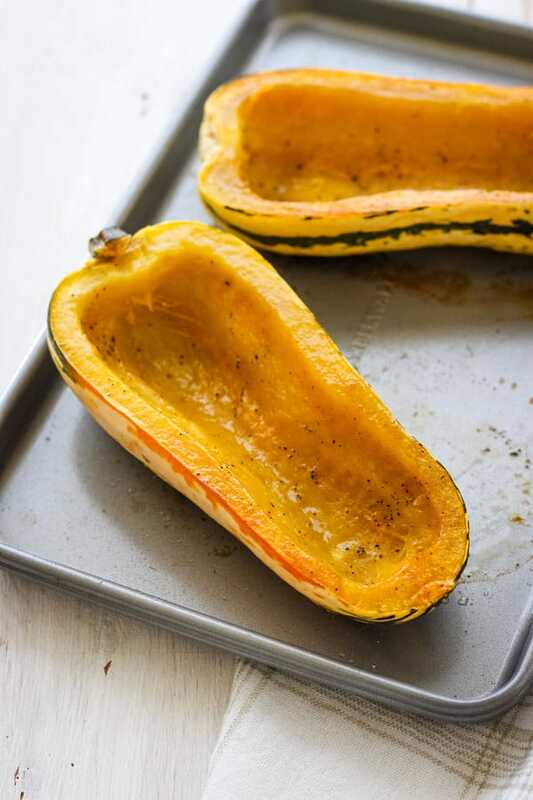 Sweet, tangy and healthy, you can’t go wrong with this stuffed squash. Adjust your toaster oven’s cooking rack to the bottom placement and preheat to 425 F. Lightly oil a roasting pan or line with a silicone baking mat. Slice squash in half lengthwise and scrape out the seeds. Rub oil onto all exposed flesh and season with salt and pepper. Add squash halves, interior side down, on the prepared pan. Roast squash at 425 F for 20 to 25 mins or until a fork easily slides into the back of the squash. Allow squash to cool slightly before stuffing. While the squash cooks, mix all of the grain salad ingredients together in a medium bowl. Divide salad evenly among the squash boats and enjoy. Step 1: Start by adjusting your toaster oven’s cooking rack to the bottom placement and preheat to 425°F on the ‘Bake’ setting. Lightly oil a roasting pan or baking sheet small enough for your toaster oven. Where Can You Find Small Toaster Oven Pans? 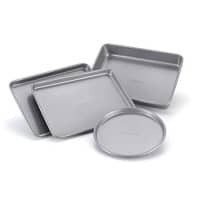 We own and use a lot of small pans in our little Oster toaster oven, below are links to a few of our favorites available on Amazon. *If you make a purchase using those links we receive a commission. 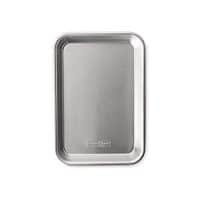 This Nordic Ware 1/8 Sheet Pan and the sheet pans in this Faberware Toaster Oven Pan Set are both great pans for smaller toaster ovens. Step 2: After washing and drying the squash, slice it in half lengthwise and scrape out the seeds. Rub oil onto all the exposed flesh and season with salt and pepper or your favorite seasoning blend. Step 3: Place the squash halves, interior side down, on the prepared pan. Roast squash for 20 to 25 mins or until a fork easily slides into the back of the squash. Cool slightly before filling. Step 4: While the squash cooks, mix together all of the grain salad ingredients in a medium bowl. 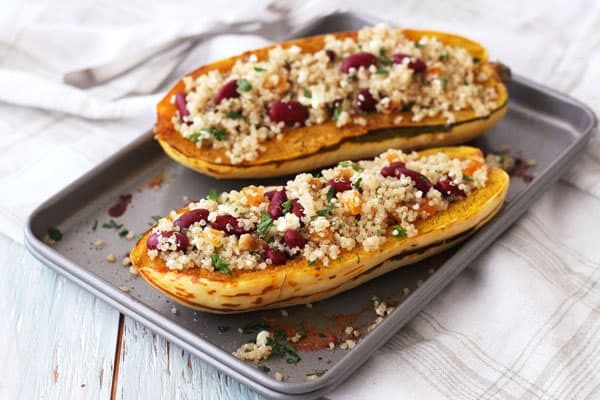 Divide the salad evenly among the squash boats and enjoy! 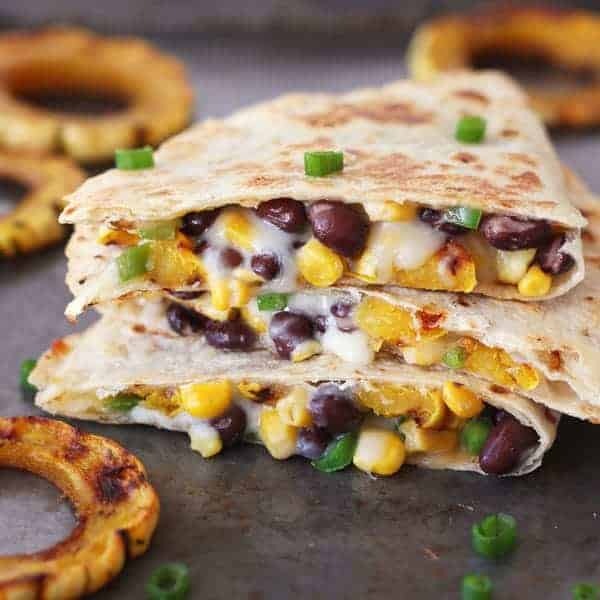 If you’re looking for more squash recipes be sure to check out this cheesy Toaster Oven Quesadilla with Squash and Black Beans, our step-by-step guide for How To Cook Delicata Squash In Your Toaster Oven, and these super fun Toaster Oven Acorn Squash Bowls that are perfect for stuffing with your favorite fillings. Thanks, Grace, that’s so sweet of you to say 🙂 It was a little embarrassing how excited I got seeing the first delicata’s of the season this weekend at Trader Joe’s, lol. I can’t wait to fill my table with lots of roasted squash and some of your yummy soup recipes!